Whether it’s for refining game design through a soft launch, maximising marketing efficiency by tracking return on investment or monitoring competitors, if you’ve got the right data and know how to use it, it can improve your game and business. Analytics companies offer support with tracking internal metrics, such as numbers of players and churn points. Then of course there are ad tools that support the detailed tracking of ad spend and returns. There are also swathes of companies in the app intelligence space offering services in that track chart positions to daily/weekly/monthly download and revenue estimates for thousands of games. Utilising these tools can help decipher which genres are doing well or are perhaps underperforming or just unpopular right now. One company offering a number of services aimed at providing both app and ad intelligence data is Chinese firm ZingFront. Its SocialPeta tool offers a number of those key intelligence services. Users can track apps by subscription rates, monitor downloads and revenues, track daily and monthly active users, and other insightful data points on a country/regional basis. What makes it unique though is that on top of this, it also provides various ad intelligence tools that helps with effective ad creatives and marketing. While user acquisition is nothing new in mobile, many developers are increasingly finding ways to integrate in-game ads into their apps to monetise the majority of users that don’t spend money on in-app purchases. The result? More ad space is opening up within the mobile app ecosystem. So developers would do well to take care and note of ever-growing popular ad formats, designs and channels inside and out of the mobile space. 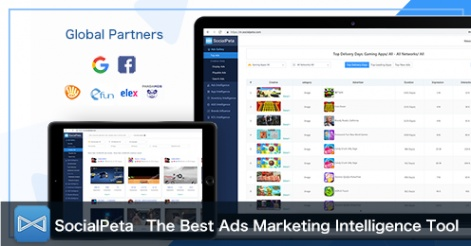 SocialPeta features an Ads Materials tool which monitors 500 million advertising creative data points, with millions of creatives updated every day, covering 40-plus ad channels in more than 40 countries. Ads Intelligence meanwhile compiles over five million data points from global advertisers. This is designed to help developers conduct in-depth analysis of competitors’ advertising strategies, including popular advertising channels, media, time ranges, countries/regions etcetera. Finally, Traffic Intelligence helps users identify where the most popular platforms are for placing ads. This includes information on popular apps and key data on PC and mobile websites around the world. This can help define appropriate strategies for social and influencer marketing, amongst other channels. As any successful mobile games company that has grown its business knows: data is key. While a bad game is ultimately likely to fail, a good game still requires a smart business strategy and efficient marketing campaign to get noticed in today’s mobile market. By utilising publicly available information and using app intelligence and ad tools, like with SocialPeta, developers can increase their chances of success in a highly competitive sector. You can find out more details about ZingFront’s services on its official website.